Craig Cerrig Gleisiaid a Fan Frynych NRW at Craig Cerrig Gleisiaid & Fan Frynych NRW0300 065 3000work Nature ReserveThere is plenty else to find on this 1200 acre reserve which takes in the summit of Fan Frynach. Over 500 different plants have been recorded as well as 80 species of birds. A variety of upland birds can be seen here including peregrine and ring ouzel. As you go up the path note the singularly appropriate memorial to Eric Bartlett. A wood has been planted in memory of this naturalist who did so much for the National Park and the work of the Brechnock Wildlife trust. Look up to the steep north facing crags. You will notice their step-like appearance of alternating hard sandstone bands with softer shaley layers. This reflects the cycles of deposition of sediment when these rocks were forming in a great delta some 400 million years ago. The carving of the landscape into the shape we see today was brought about by the glaciers of the last Ice Age. Moving ice plucked pieces off the north facing slopes. Many were then dropped by the melting glaciers on the valley floor, or slumped in large landslips, giving rise to the hummocky ground. On the bare rocky ledges facing north there survive some of the rare arctic/alpine plants which colonised the landscape as the climate warmed after the Ice Age, and are now generally restricted to more northern latitudes. They can survive here because the sun rarely reaches them and the difficulty of access prevents sheep grazing. Be warned, and follow suit. Do not climb the crags and screes. 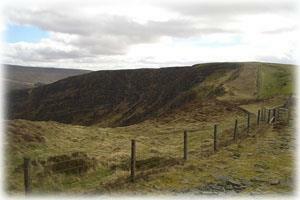 This is just one of several areas you can explore in the central part of the Brecon Beacons. Two miles down the road towards Merthyr Tydfil is the car park and starting point for walks up to the summit of Pen Y Fan. For the less active there are the reservoirs to be explored alongside the A470, or for moorland views take the A4059 towards Aberdare. This is also the way through the valley of the Afon Mellte with its spectacular cave and waterfalls south of the village of Ystradfellte. There is a network of clearly waymarked paths here from the main car park at Gwaun Hepste, where there is a Forest Enterprise visitor centre. It is only a short walk to the main cave of Porth yr Ogof. North of the reserve 1.5 miles off the main road west of Libanus is the Brecon Beacons National Park visitor centre. It has displays on the wildlife and landscape of the park and a shop stocked with local literature, maps and guides. PARKING : Lay-by on A470, 5 miles south of Brecon, 1.5 miles north of Storey Arms. TIME : Don't rush it. Come here for half a day and picnic in the area set aside by the road. 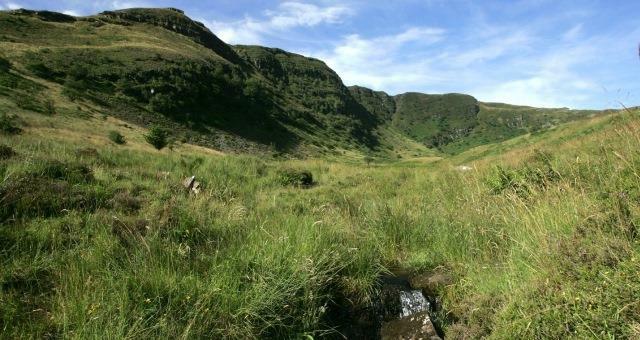 There is plenty else to find on this 1200 acre reserve which takes in the summit of Fan Frynach. Over 500 different plants have been recorded as well as 80 species of birds. A variety of upland birds can be seen here including peregrine and ring ouzel. Leaflet, information boards, waymarked footpaths. The easiest approach is directly from the lay-by on the A40 Brecon to Merthyr road about 5 miles from Brecon at grid ref 972223. A stile takes you over the wall and onto the main path through the reserve.